When Captain Steven Hawklin is attacked by a warplane over Southern California he is thrown into the secrecy and intrigue of the Shadow Men, an ultra-classified branch of the British government bent on keeping the Empire safe at all costs. It seems one of their agents has gone rogue and is out to kill Captain Hawklin. Meanwhile at the behest of Professor Lucas Gray, Oscar “Oz” Lyman arrives in the mountains of Montana, to investigate the mysterious appearance of an Indian God who has invoked a local Blackfoot Tribe into committing acts of violence, preventing the construction of a new ski resort. Suspicious, Oz leads an expedition into the mountains to find the real reason behind the strange phenomenon. Approached by agents of the Shadow Men, Steven learns the motive of the person out to kill him, understanding the past is never forgotten, he agrees to help track down the wayward agent, in a race against time to prevent the death of his trusted friend, Hardy Miller, who becomes entangled in the villainous plan. Traveling to Germany, Steven is given one chance to rescue his friend in a do-or-die aerial battle that will prove once and for all, the true master of the air. Captain Hawklin and the Shadow Men, is a throwback of a bygone age of pulp adventure stories. Filled with spies and mythological gods. 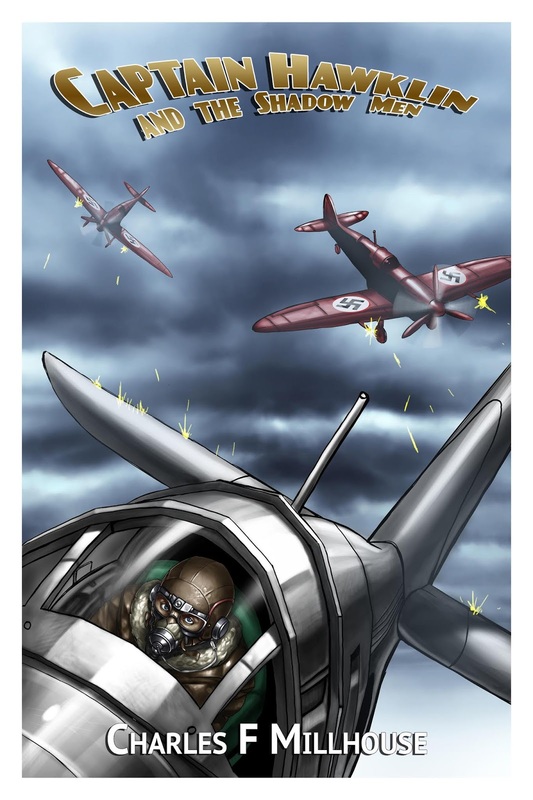 Nazis, cliffhangers and action in the tradition of Doc Savage and Commander Cody. The Captain Hawklin Extended Universe. The Next Captain Hawklin Adventure... Set the date. 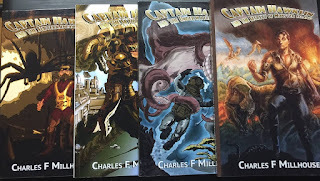 Captain Hawklin is a series of New Pulp Adventure novellas written by Charles F. Millhouse set in the golden age of adventure - the 1930's. The story centers around the daring exploits of Steven Hawklin and his two trusted companions, Hardy Regan Miller and Oscar (Oz) Lyman. Inspired by the cliffhanger serials of the 1930's and 40's and the pulp magazine stories of that same era. The adventures of Captain Hawklin are filled with heroes and villains, swindlers and thieves, Nazis and pirates. Discover the adventures, here on the official site or on Captain Hawklin's Facebook page.